Stop NY Pipeline | What a Fair! Home › Uncategorized › What a Fair! Although all the bills have not come in yet, it appears that we spent about $6,000 to put on this year’s Fair and brought in about $7,000, giving us enough money to jump start next year’s Fair. 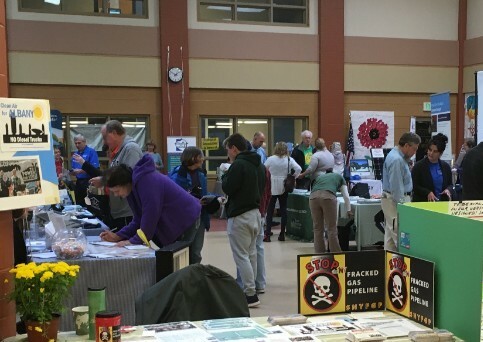 The combination of having community-minded exhibitors, motivated attendees and the many CASE volunteers (more than 30) resulted in not only a wonderful Fair, but after three such events, it does seem that our economic model of having a free public event is sustainable. We had a variety of multi-media advertising and received some good press (Channel 13) and the Albany Times Union. Doane Stuart School provided us with green roof tours, solar panels, and a cooperative staff. There were close to 100 people attending our keynote speech given by geothermal expert Jay Egg at midday. Jay Egg’s warmth, humanity, knowledge and “down to earthiness” were a delight. The Program Booklet (28 pages) was distributed widely and printed by a union shop on 30% recycled paper. 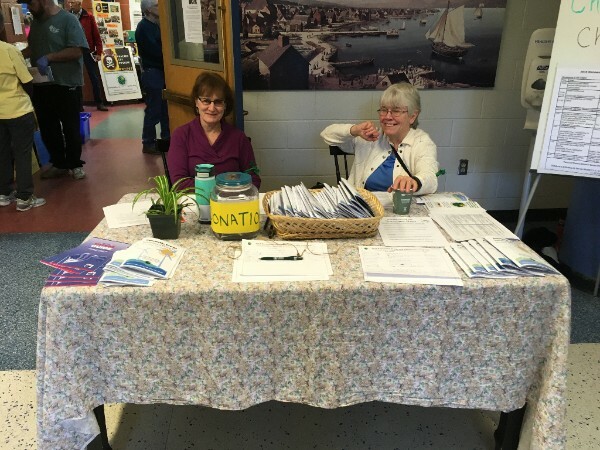 Indeed, the many positive results from this years’ Fair were made possible by the fantastic work of a dedicated core of volunteers throughout all the phases: planning, organizing, promoting, tabling, selling, cleaning up, other on-site work, etc. 132 Fair photo link from John Ciovacco of Aztech Geothermal. Fair photos from David Edwards. Welcome. Step right up, sign in and get your program book. 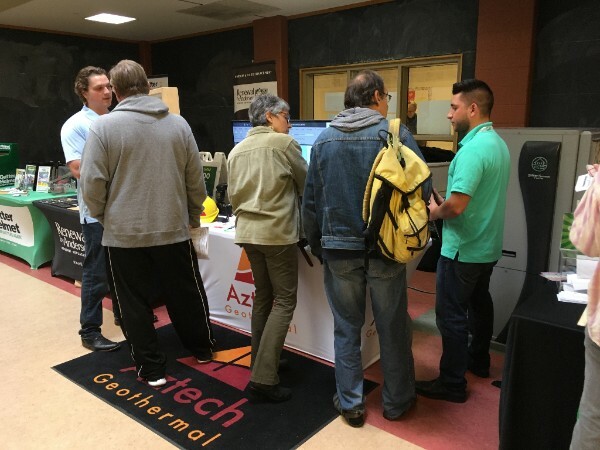 Aztech Geothermal (along with 23 other for profit companies) tell customers about their product. The CASE food table sold home made food to nourish the crowd. One of the 17 workshops offered throughout the day. Ken Stokem gives introductions to the midday keynote address in the chapel. Congressman Tonko has come to our fair every year.